With the June VHF contest comes possibilities of sporadic E (Es) propagation, high levels of participation and, in the Pacific Northwest, some possibility of snow closures at higher elevations. This year, the snow stuck around for a long time, but cleared up in time for me to rove to some of my favorite 3000’+ locations. I did the contest as a limited rover again this year—limited to four bands and modest power levels. The rove took me around western Washington from Granite Falls down to the Columbia River gorge and from near Mt. Rainier to the Pacific Ocean. The equipment list is pretty similar to what I used last year, with a little reorganization of both the weak signal and FM equipment. 223 MHz FM: Jetstream JT220M with 223 MHz into Mirage 100w brick. …a total of six radios, one transverter, and five bricks. For many rigs, the heads were mounted remotely on the center console; two rotor controls and an antenna switch box can also be seen. The planned route is identical to last two years. This map shows the general locations. This year, I stuck pretty closely to the route and timing. The contest starts out in Ocean Shores, WA in CN76 and then north 1/2 mile to the CN77 line. Saturday afternoon is a long trek to Kalama, WA to work both CN85 and CN86, and finally an evening trip into CN95 on the Columbia river near N. Bonneville, WA. This year I stayed in a motel in Woodland, WA for the night. Sunday morning began with a drive from Woodland to Mowich Lake Road near Carbonado, WA, which permits me to hit CN87 at 2,160′, CN86 at 3,000′ and CN96 at 3,100′. Next, CN97 and CN87 are activated from Central Park, Issaquah, and then off to CN88 at a school parking lot (400′) in Lake Stevens. The contest ends on the side of Mt. Pilchuck at about 3,000′. I got a good, early start on Saturday, and, unlike last year, I arrived in Ocean Shores with plenty of time to set-up antennas and test out radios and amplifiers. Everything seemed in order. Starting out the contest in Ocean Shores may not be ideal, since I miss many of the weaker signals in populated areas. But I usually pick up lots of interesting multipliers. From CN76, I almost immediately worked KB7W in CN93 and W7EW in CN84 on 2m. On 6m, I managed to work my buddy John, KF7PCL in CN76 on 6m. I believe he was operating portable from another event in Westport, so 6m was his only band. Frequently we work 2m and 432 MHz, as his home is nearby. I also worked Gabor, VE7JH/R in CN88 on 222 MHz, quite a trick considering the Olympic Mountain range is directly between us. Many of the same QSOs were repeated from CN77. I briefly passed through CN76 while enroute to CN86. From there I managed to work VE7FYC in CN89, still with the Olympic Mountain range separating us. The rest of the drive through CN86 (with a brief few miles in CN87) was modestly productive, but things really picked up at the stop on China Garden Road in Kalama (CN86). Five miles to the south, in CN85, things picked up even more. One thing I noticed down there is that there is much more contest activity on FM calling frequencies in the Vancouver, WA/Portland, OR area than in the greater Seattle area. There were a lot of “bonus” QSOs on 2m and 446 MHz FM while I was in CN85 and CN86. Sunday morning began at 4:30 am (local) to be on the road by 5:00 am for a long drive to CN96. It took an hour and twenty minutes to make my first (in-motion) QSO at this early time. But things picked up and I made 23 QSOs while travelling through CN87 and a few more while driving 15 minutes on a bumpy dirt highway through CN86. I arrived in CN96 by 7:45 am (1445z) and worked folks in CN87, CN86 and even CN85. Around 1510z, there were signs of an Es opening, and I worked a handful of stations (and 7 new grids) centered around DM43 before the opening fizzled out by 1600z. Another hour in CN86 (again!) yielded plenty of QSOs, but no Es DX. The next stop was Central Park in the Issaquah Highlands. Business was good from CN97, and around 2000z, there was a mild Es opening that provided a handful of QSOs and 4 new grids. My attempts to work new grids were briefly interrupted when a police car pulled up to check out what I was doing. Someone called the police reporting a truck with a lot of antennas. The cop was totally cool about it. At 2100z I moved into the CN87 end of the long parking lot with hopes of working more Es as well as plenty of locals. 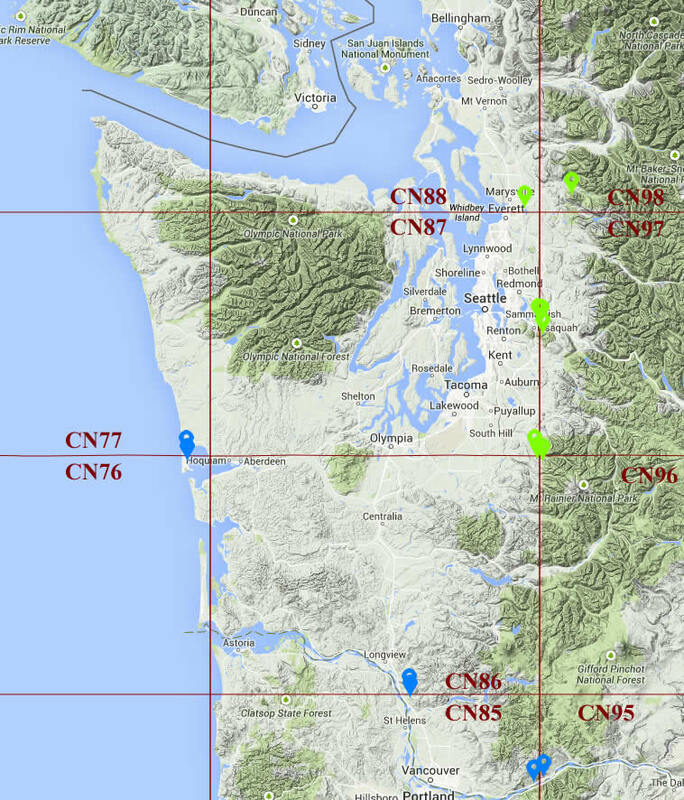 Alas, no new grids were worked, although there were plenty of folks in the Puget Sound region providing QSOs. Enroute in CN87 to CN88, I connected on a couple of bands with Gary, WA7BBJ/R, who was in CN98—a grid I frequently activate, but less-frequently work. In CN88 (from a school in Lake Stevens), I worked Gary on the other two bands, and also worked Jason, KE7UIU, in CN98 on 3 bands. In CN88, I also worked John, VE7DAY, in CO70 on 2m (I had worked him a couple of times on 6m already). The final stop of the day was the side of Mt. Pilchuck at about 3,000′. On the way up the forest service road, I passed WA7BBJ/R heading down. We completed four CN98 to CN98 QSOs. The grid itself was quite productive. There was a nice Es opening, but apparently Mt. Pilchuck was between me and the patch producing the opening. In hindsight, I should have gone to another 3,000′ location on the road to Green Mtn during Es season. It would have given me a shot at Es and a few more multipliers. In fact, although I worked 73 QSOs from CN98, only the last one, with VE7AHA in CN89 on 6m was a new multiplier. That was also in the last minute of the contest. Last year I made 522 QSOs for 667 points, and 55 grids worked + 10 grids activated for 65 multipliers. Last year’s (preliminary) score was 43,355. I was able to improve on most of these stats.